Last minute guests? 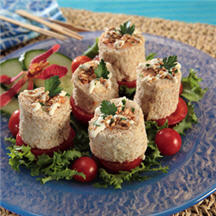 No worries, these tasty hors d'oeuvres can be assembled quickly with ingredients usually found in a well-stocked pantry. Combine salmon and seasoning sauce in small bowl. Press bread slices with palm of hand to flatten. Spread with mayonnaise. Place 8 cucumber pieces and 1 heaping tablespoon salmon mixture along one side of bread slice. Roll up tightly and cover with plastic wrap. Repeat with remaining bread and filling. Refrigerate for 30 minutes. Cut each roll into 4 pieces. Place each piece on a tomato slice. Drizzle with media crema; sprinkle with sesame seeds and parsley. Serve immediately.